Guten tag, Germany... and welcome back. Hockenheim returns to the Formula 1 calendar after a one-year hiatus this weekend, and what better way to get the German fans through the gates than having one of their compatriots sitting atop the drivers' championship. Come Sunday, Sebastian Vettel will be aiming to do what Lewis Hamilton could not at Silverstone - win on home soil. The headlines were already written for the Mercedes man to claim a record sixth British Grand Prix victory but the prancing horse had other ideas. Instead it was Vettel who held aloft the winner's trophy to extended his lead this intriguing title race to eight points. So what does the 2.842-mile Hockenheim circuit bring to the table? Bust-ups, crashes and emotional drama, it would seem. Situated in the Rhine Valley, the original circuit at Hockenheim took drivers on a flat-out thrill ride through lush, green forests. Throw in some ewoks and a couple of speeder bikes instead of F1 cars, and it could easily have doubled-up as Endor from Return of the Jedi. In 1982, Nelson Piquet was leading the race for Brabham and looked certain for a podium finish; enter Eliseo Salazar. As Piquet attempted to lap the inexperienced backmarker, a clash of wheels sent the Brabham and ATS into a spin and into retirement. The incident had a glimmer of the Hamilton v Raikkonen, first-lap Silverstone drama about it. The aftermath, however, took a punchier turn. Brazilian Piquet leapt out of his car like a raging bull, launching himself at the Chilean, fists flying, and with a rather ungentlemanly kick towards a delicate area. If only Instagram had been available back then for these two to sort out their differences. The dawn of a new millennium saw another Brazilian make the Hockenheim headlines, this time for the right reasons. Step forward Rubens Barrichello, 122 grands prix into his career and still no victory parade. 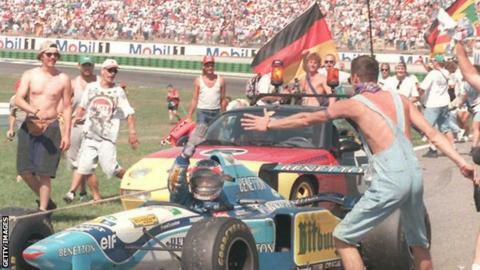 Starting 18th on the grid and having German legend Michael Schumacher as a team-mate, it didn't look very promising. But somehow it all fell into place. Schumacher went out in a first-corner crash, a track invader triggered a safety car and the heavens opened. All the while Barrichello drove faultlessly through the field before the tears of joy came as he crossed the line for a stirring maiden win. Two years after that historic moment, the long straights through the forests were given the old heave-ho, with a shorter layout built around the existing stadium section. It's fair to say the alterations have not been universally embraced. Indeed, if you take a glance at fan forums the post-2002 Hockenheimring does not get the same love that was bestowed on the old track. But a victory for Vettel would surely set aside some of those misgiving among the home faithful. How many grand prix winners from Germany can you name? It's a simple question... with a few very easy answers, perhaps? Seven German drivers in total have claimed top spot on the podium at various circuits since the 1960s. There are only two minutes on the clock to guess them all. How many German winners can you name? When children start their first day of school in Germany, they receive a schultute, which is a large cardboard cone filled with toys, chocolate and sweets. According to German law, a person's gender must be obvious by first name, so the civil registration office, or Standesamt, can refuse names that don't comply. In 2013, Germany dumped the mammoth, 63-letter word Rindfleischetikettierungsuberwachungsaufgabenubertragungsgesetz. It translates as "law delegating beef label monitoring" and despite the German's love for extended compound nouns, was deemed a tad excessive for the modern language. There's no middle-lane hogging in Germany. When using the famous Autobahn, motorists stick religiously to the rules of the road: keep as far to the right as possible and use left lanes for passing only.